Problems can not change existing accounts !! - General Discussion - Mobile Legends: Bang Bang - Powered by Discuz! Mobile Legends: Bang Bang»Forum › Here I come › General Discussion › Problems can not change existing accounts !! [Complaint] Problems can not change existing accounts !! I can not convert my existing account, please help me, I hope your Company can solve this problem right away! Please report this to our in-game CS. Help me, i can not play if my account can't switch, this is bug or what? Please help me, i can't play mobile legends almost 2 weeks !! Or maybe try to update in playstore.. i read about this last night in game.. Check if the game have any update, try again. Make sure you click right account information first. Then reinstall the game and try again. If you did really bind that account then only possible way to fix this is to contact in game cs. It is located on the top left corner blue headset icon. Tap on it and go to help>account problem>reinstall the game>get the form>fill it up>submit. And then wait for reply. Your data is probably wrong..so check again if you typed right. Also, reinstalling the game is a good ideea to try. I see you`re using android..there is another thing you can try.. go to Settings -> Applications -> Mobile legends bang bang -> Data -> and delete all data from the game. This means, it will delete any data you have saved in the game (your logged account) and basicly it's like starting over..and try to login your account. Try all of the things we have told you and then come back with an update . 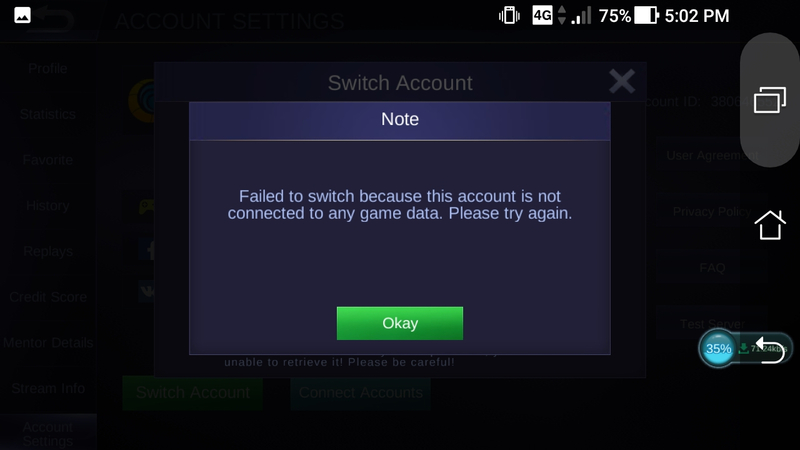 I do all of your sugguestion, still can't switch account, WELCOME TO MOBILE OF BUG moonton !! I'll spend money for you, then do you ignore player like me.. Nicer moonton !! I think vainglory & * is the best games for now, i only have one choice to make it right now, uninstall your games? Do you don't even care about your player like me right moonton?